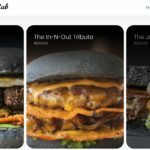 myBurgerLab In-N-Out Tribute - Burger Review, Price, Calories & More! This is a tribute to our first (burger) love from In – N – Out, The 2×2 DOUBLE Sharp Cheddar Beef Patty seared w/ Mustard + Secret Sauce. Price: RM24.50 (with pickles) approx. £4.67. 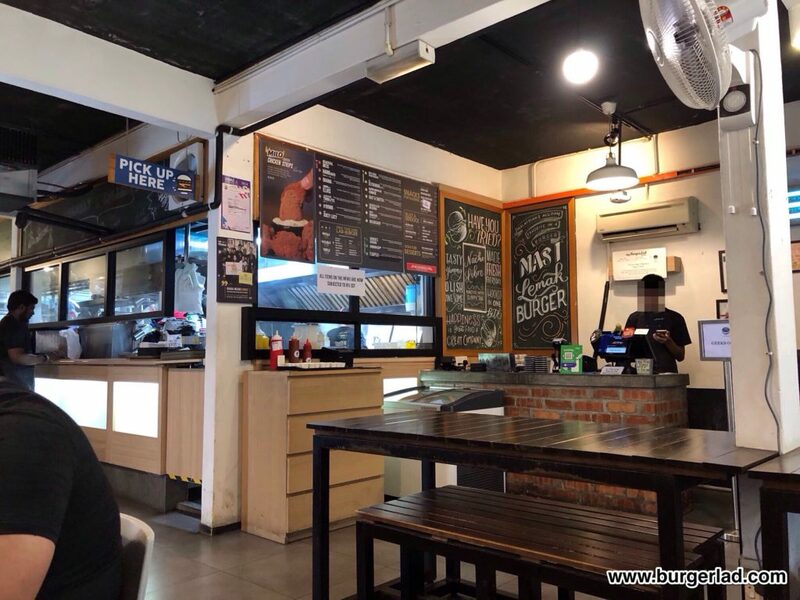 MyBurgerLab is a newish small chain of burger joints in the greater Kuala Lumpur area. 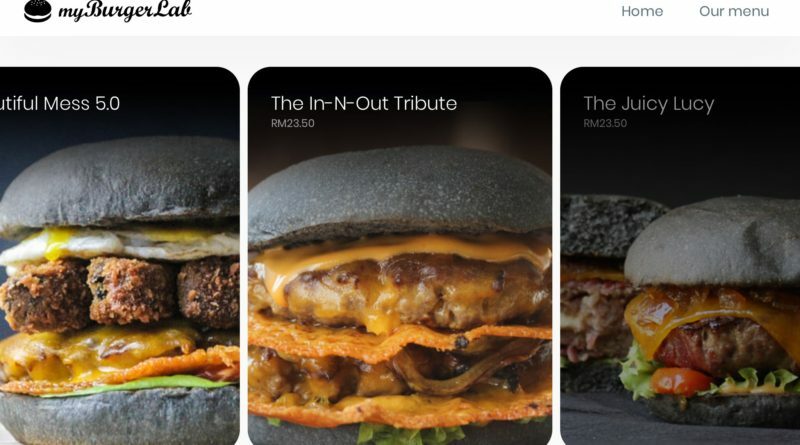 They spring up along with competitor KGB (Killer Gourmet Burgers) to exploit the growing wealth and internationalism of Malaysian millennials and Gen Zs. The price list is largely like UK gourmet burger joints, when considering average incomes. There are several Malaysian type items to choose from, including a chicken nasi lemak (fatty rice – it doesn’t translate well!) burger with egg. It took me a while to decide, mainly because I wanted beef and I didn’t want egg. Egg on a burger – discuss! (That’s your homework for the comments below, dear burger crew). Before I got to my choice of burger, a poster for a special side caught my eye – Milo-coated chicken strips with Budu sauce. Now, for the uninitiated, Milo is a chocolate drink (hot or cold) that has somewhat cornered the market for Nestlé in south east Asia. 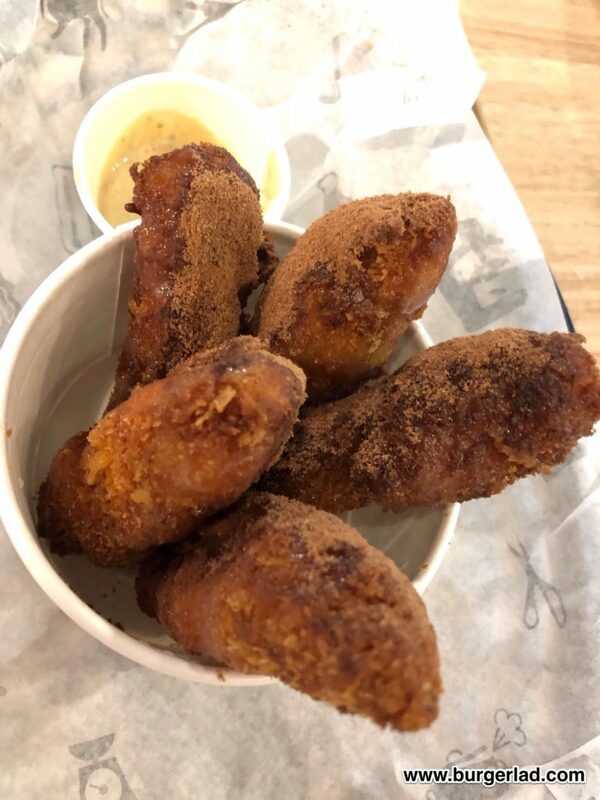 So, the equivalent at home would be fried chicken with a hot choc powered coating. Does it work? Well, sadly to say it doesn’t. Not at all. In fact, it’s pretty horrible. The spicy Budu sauce dip was fairly exciting until I discovered it was made of preserved anchovies. Anyway, onto the burger, because this is where things picked up. The burger I chose was myBurgerLab’s tribute to the western US chain In-N-Out, which I’ve previously reviewed here in Arizona. It was reasonable, I recall, if not perhaps living up to the hype. 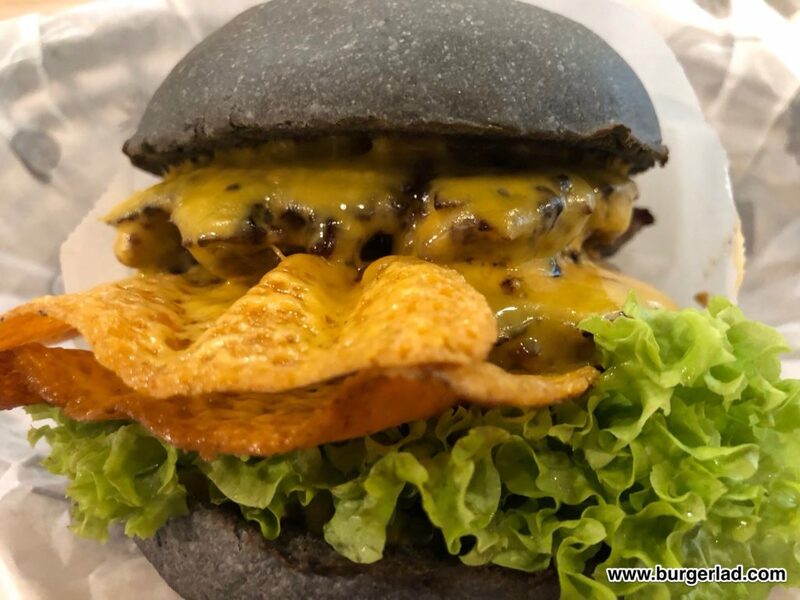 All the burgers here come with a charcoal black bun. This was cutting edge perhaps 3 or 4 years ago back home, and it even made a Halloween appearance at Burger King. 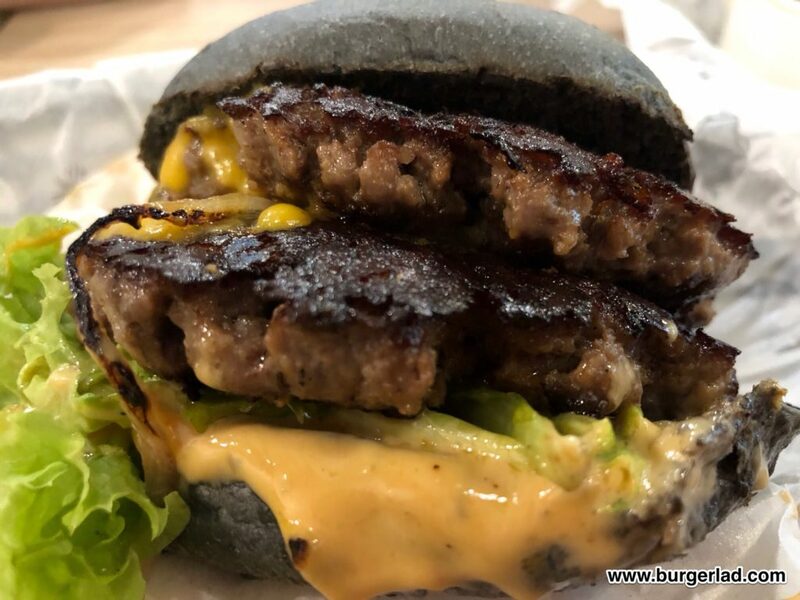 But now, it’s not, frankly, and a whole menu of black buns, they just looked dirty. And not dirty in a good way. So, it was a thumbs down for the appearance. And the side dish. 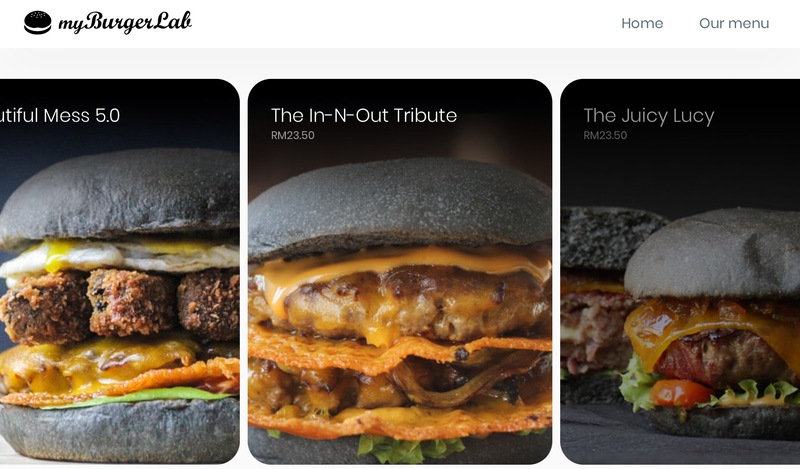 myBurgerLab wasn’t doing well until I put the In-N-Out Tribute to my mouth. A double cheeseburger, and it was clearly larger than the original on which it is based. Almost too big for my big mouth, almost. This was delicious. It had two waves of crispy cheese sticking out. I’m going to assume this was on purpose rather than a dribbly mistake on the grill. I’m assuming this, because I rather liked it. 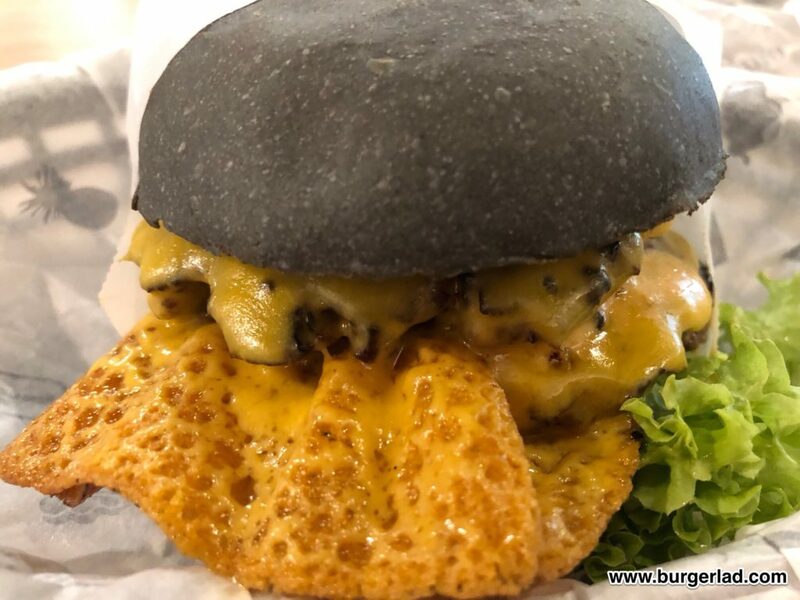 As opposed to a black bun, a few bites of crispy cheese was something I rather enjoyed! And I most certainly enjoyed the beef. This was a terrific blend perfectly made. It was thick, coarse and the taste was sublime. It was cooked well-done as far as I could see, but it clearly had a proper fat content and I loved it. This big stack was finished off in no time, and all memories of the yucky side dish were resigned to the brain-bin. I loved the In-N-Out Tribute – a delicious and very well-prepared burger. The decor inside with concrete benches was a little too industrial for my liking, and even the menu highlighted the target market – 20something Youtubers. 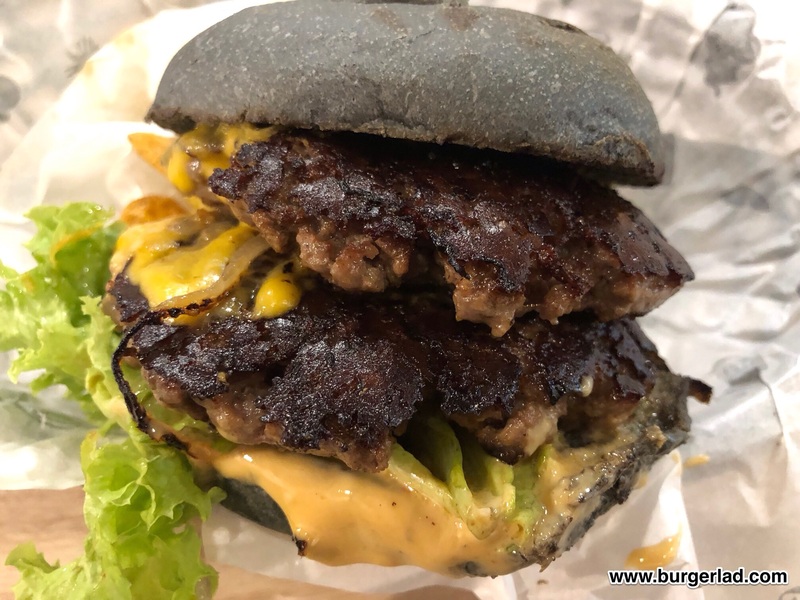 The beef is seared with mustard and a “secret sauce” which serves to elevate the flavour and inject a degree of pep into an already delicious stack. It is, however, a little burnt if we are honest. I’d prefer a bit less on the grill and this would still be delicious. That along with the black bun led to a lower score on the presentation. 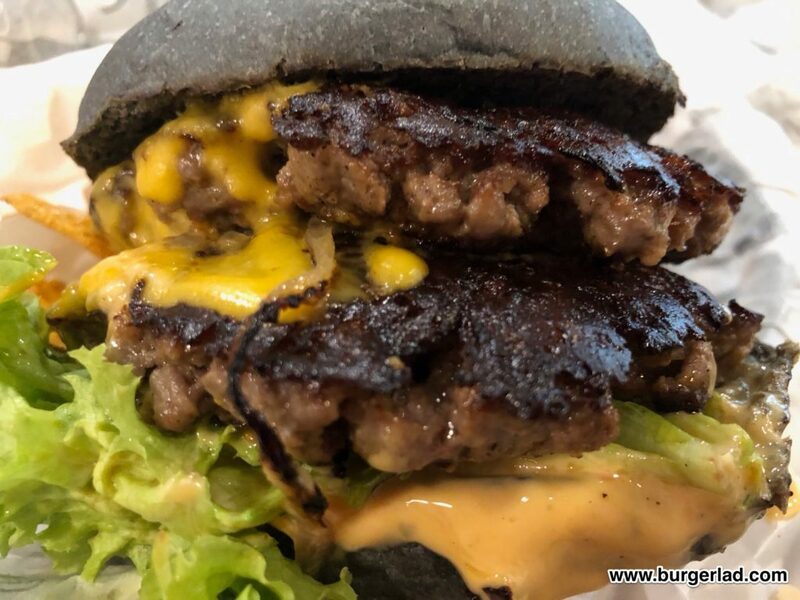 Black meat and black bread – yes, OK it’s a bit of a change from beige, but it’s a bit heavy on the eye. If it weren’t for the fact that I’m due to return to Blighty, I’d definitely return to myBurgerLab. I want to try the chicken burgers and they even have a build-your own option.